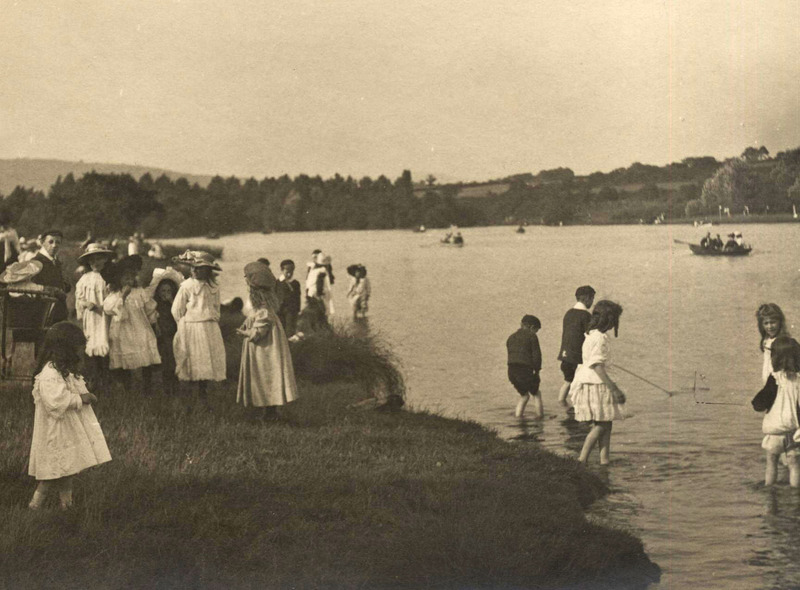 When Roath Park was created, work initially focused on forming the lake from an area of marshland by the damming of the Nant Fawr stream. Construction of the dam (later known as the Lake Embankment or Promenade) across the Roath Valley was completed in 1891. By the end of 1892 the islands at the north end had been established and planted with trees. The lake was filled with water in mid December 1893. By 1894, when the park officially opened on June 20th, the lake was complete with a landing stage and 50 boats available for hire. Boathing, bathing, model yachting and fishing were all part of the earliest planning. When completed the lake was half a mile end to end, and one mile and a quarter in circumference, with a depth varying between two feet and more than fourteen feet. It had a surface area of about 32 acres. The Parks Superintendent (William Pettigrew) reported that in October 1897 an otter living at the top end of the lake was taking a lot of fish, also fish spawn and ducks. In the same year came the first occurrences of problems with silting and weeds in the lake. Much effort was put into clearing the weeds: 14 men were employed full time from 14th July to 23rd August and they ensured a successful August Bank Holiday weekend for boating. During 1899 two shelters were built, one on each side of the lake, large enough to accommodate 100 persons in each. These were evidently not as ornamental as the rustic shelters placed elsewhere in the park: they were described by a member of the Parks Committee, Councillor Good, as "unsightly...improved cowsheds." The eastern shelter can be seen in a number of the postcard views of the lake's east bank. Weeds remained a problem and in the early 1900s the annual practice began of lowering the water level during the winter to expose the aquatic weeds to frost, which effectively kept the problem under control. In June 1904 the weeds were worse than previous seasons, thought to be because the water was not kept out of the lake long enough during the previous winter to allow frost to kill the weeds. It was deemed necessary to purchase a Wadham's Simplex Aquatic Weed Cutter. In November 1906, following a request from residents of houses in Lake Road West, the Parks Superintendent was authorised to create a second gate on the west side of the lake opposite the islands, in a similar position to one on the eastern side. 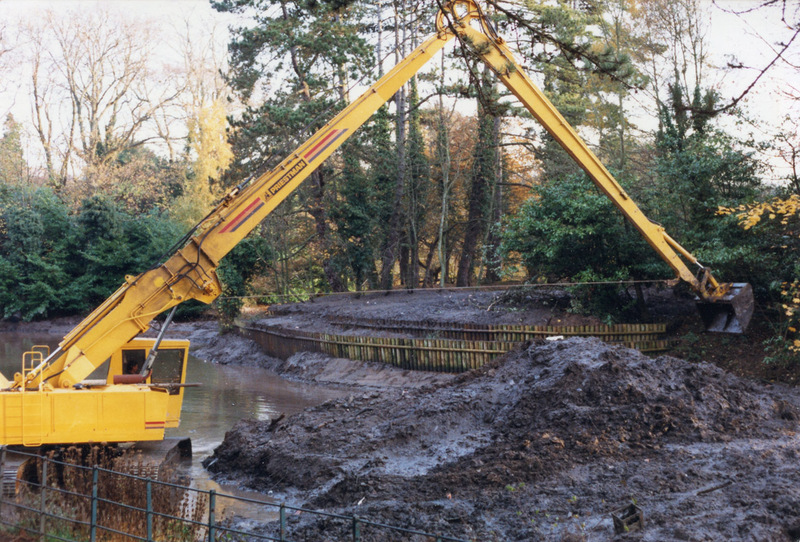 In the winter of 1908/09 unemployed men engaged by the Council Distress Committee undertook various work in Cardiff's parks, including the reclamation of the banks of Roath Park Lake, which had been partially washed away over the years. At a Parks Committee meeting in November 1908 the Parks Superintendent reported that between three and seven yards had been reclaimed along a 100 yard length on the east side of the lake. In the following January he reported that along the entire length of the east bank a strip of land had been reclaimed and raised above water level with siltage taken from the bed of the lake. In the winter of 1909-10 the Distress Committee engaged between 35 and 40 men to carry out similar work on the west bank of the lake, and also to construct earth terraces adjacent to the bathing boxes on the east bank. These terraces were to accommodate a grand stand for spectators for aquatic sports. Similar terraces were created on the west bank overlooking the bye-wash. All this work was completed during March 1910. The accumulation of silt required regular measures over the years for its removal. For example in December 1916 it was necessary to clear the silt at the north end of the lake to ensure that boats could pass around the islands. In 1925 it was estimated that clearing silt from the bed of the lake adjacent to the islands and at the bathing stage would require 80 men for ten weeks and would cost £3,300. From 1927 the level of water in the lake was lowered every year between October and March for the additional need to prevent a repeat of the floods that occured in Roath on the 1st - 2nd November 1927. This had a detrimental effect on both winter rowing and model yacht sailing. In December 1930 the City Engineer reported on a suggestion that "to preserve the amenity of the Park during winter months, when the level of water was reduced, a large area of the bed of the Lake, particularly around the islands, should be covered with water". A plan for the construction of dam across northern end of Lake costing £400 was deferred. In the early 1950s a concentrated effort was made to address the problem of silting particularly at the north end of the lake. In November 1952 there were complaints about the "unsightly appearance" and "unpleasant odour" from the mud there. Work was planned over several years and involved partially draining the lake, which resulted in protests from Lake Road East residents about the "desolate appearance thereby created". In February 1955 the work was complete and the lake was refilled. Only three years later silting was an issue again and was believed in part to be due to the discharge of surface water from the new housing estate. 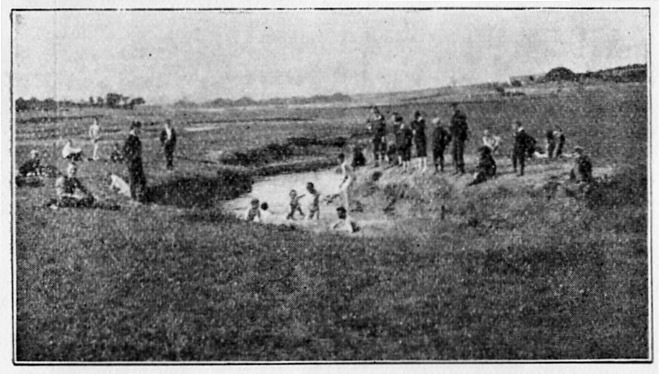 Public bathing in the lake was discontinued in 1959 owing to concerns about water quality. Early in 1981 it was reported that a bacterial survey of the lake had been introduced three years previously to monitor water quality during changes to the surface water drainage in the north of the city. The results showed an increase in pollution and the Leisure and Amenities Committee was informed that immersion sports had been stopped, though experienced canoeists were still allowed to use the lake. An investigation was in hand to establish the sources of pollution. Combining the islands c.1988 ©John Lee. By 2001 it was thought that to restore the lake to its original depth would require removal of 120,000 tonnes of silt, at an estimated cost of £500,000. The Council commissioned a detailed study to establish the causes of silt build-up and to identify methods for its removal, as well as sources of funding. Another major de-silting operation began in October 2002, the plan being to bulldoze the silt into piles near the islands, where it would dry out prior to being taken by lorry to landfill at Lamby way. The final phase of this exercise took place between April and June 2005. In general, the information in this section is taken from A. A. Pettigrew, The Public Parks and Recreation Grounds of Cardiff, Volume 3.